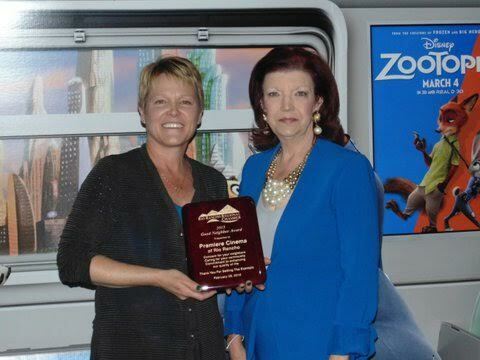 The greater Rio Rancho area Chamber of Commerce has bestowed their esteemed "Good Neighbor of the Year" award to Premiere Cinema's Sandy Dodson. The selection is based on the company's contributions to the community said Chamber Vice President Paul Barabe, who noted, "Premiere Cinema exemplified this support in 2015." Premiere's Dodson was singled out for being instrumental in arranging events that benefitted the Rio Rancho Community Foundation and assisting non-profit organizations within the Rio Rancho area. Ms. Dodson assisted with the Mayor's Gala as well which was themed "Welcome to the Galaxy of Giving - Celebrating the Wonders of the Universe". The event was strategically "Star-Wars-themed" and scheduled around the opening of the decade's hottest movie events, "Star Wars: The Force Awakens" which debuted to eager audiences at Rio Rancho's Premiere Cinema. A few of the organizations benefitting from this work included the Children's Grief Center of New Mexico, Family Services for Children, Haven House, Life Roots, St. Felix Pantry, and Communicate Garden at Our Lady of Sorrows Church in Bernalillo, New Mexico. "Premiere has a culture of giving back to community," said Premiere's Joel Davis, VP of Operations. "Sandy loves the people of Rio Rancho and shows her support and is among the most outgoing and energetic forces of nature you can ever imagine! She never misses an opportunity to get involved locally with groups and promotions." The Mayor's Gala was especially successful raising money this year, and Premiere's involvement was reportedly among the most talked-about and fun-filled parts of the fundraising event. Premiere Cinema is located at the corner of Southern & Unser at 1000 Premiere Parkway. It has been serving the residents of Northern Albuquerque and Rio Rancho since 2011.